Bag Taper "Ninja"��San-Ai Corporation, U.S.A.
Home > Newest Products > Bag Taper "Ninja"
Very easy 2 steps to complete the taping and creates Easy-Open tape! Insert the bag into the dispenser slot. ��Tape, close, and cut automatically. The side edge of the tape will be automatically folded and become Easy-Open tape! 2. Trim the excess bag with the Bag Cutter located just below. Smooth operation. Very easy and quick operation. Automatic taping and easy trimming. 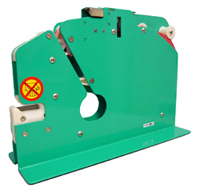 The automatically folded tape provides"Easy to open" for customers. Great value-added.